These light and easy Chicken Caesar Burgers are a deconstructed take on the classic salad. No egg, breadcrumbs or weird fillers! Simply ground chicken and everything you love about Caesar salad, served with Parmesan Peppercorn Sauce on a buttery brioche bun! Hey hi hiiii, friends! Welcome to Monday! Wait! Before you roll your eyes at me for my chipper disposition, just know that this ain’t any ‘ole run of the mill Monday. No ma’am (or man)! THIS is the LAST Monday of OFFICIAL spring! Are you shocked? Did you think we were already all up in official summer? Well, silly pants, we aren’t. Not yet. But, we are, like, thiiiiiiiiiiiiiis close though. Summer officially starts Wednesday, June 21st at 12:24 a.m. EDT. Hooray! Despite the fun fact that we are still very much in spring, we are going to EAT like it’s officially summer. Why? Because BURGERS. I need to eat some burgers. You need to eat some burgers. WE NEED TO EAT SOME BURGERS. Am I right? 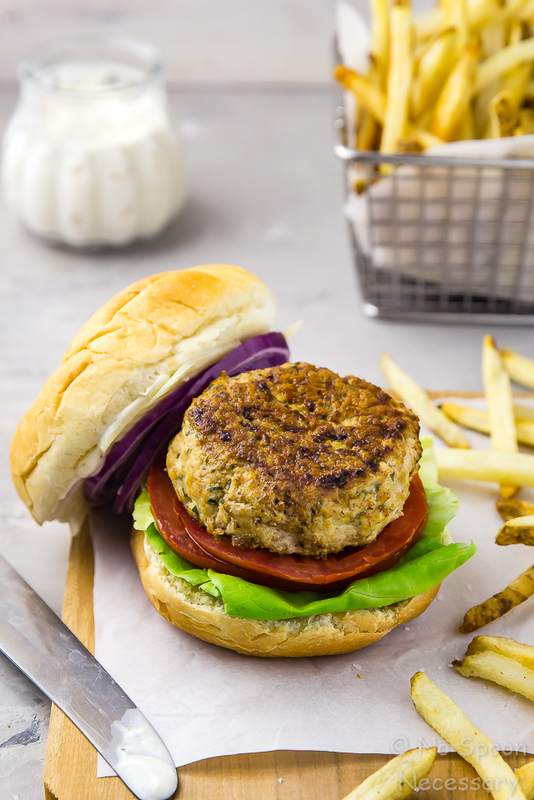 Here’s what’s happening in these Caesar burgers – tender, juicy ground chicken patties with notes of salty parmesan, pungent garlic, herbaceous parsley and flavorful Caesar dressing. Topped off, and piled high with your favorite classic Caesar salad accoutrements – think lettuce (duh), tomatoes, red onion, anchovies (YES!) and thin shavings of parmesan. Served up on a soft and buttery brioche bun generously smeared with a thick and creamy sauce spiked with parmesan, garlic and black pepper. The creamy parmesan sauce mimics and highlights the flavors in the burger, and together everything just SO gosh darn GOOD. 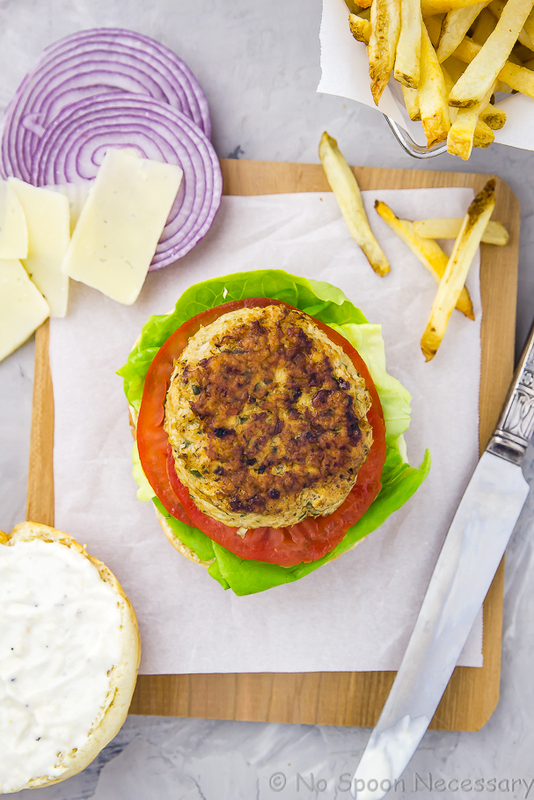 This burger has all the textures – crisp and cool, warm and savory, and 100% delicious! Plus, this Chicken Caesar Burger is lighter and healthier option, because none of those red-meat-sweats happening here! After one bite of these Parmesan Peppercorn Sauce smothered Chicken Caesar Burgers, you’re going to want to turn ALL your salads into burgers! Trust and believe. What is a Caesar Burger? A Caesar burger takes all the flavors of a classic Caesar salad and turns it into a burger. Caesar burgers are consist of a burger patty topped with crisp lettuce, creamy Caesar dressing and parmesan cheese. The burger patties can be all-American beef patties or healthier chicken patties depending on the recipe. 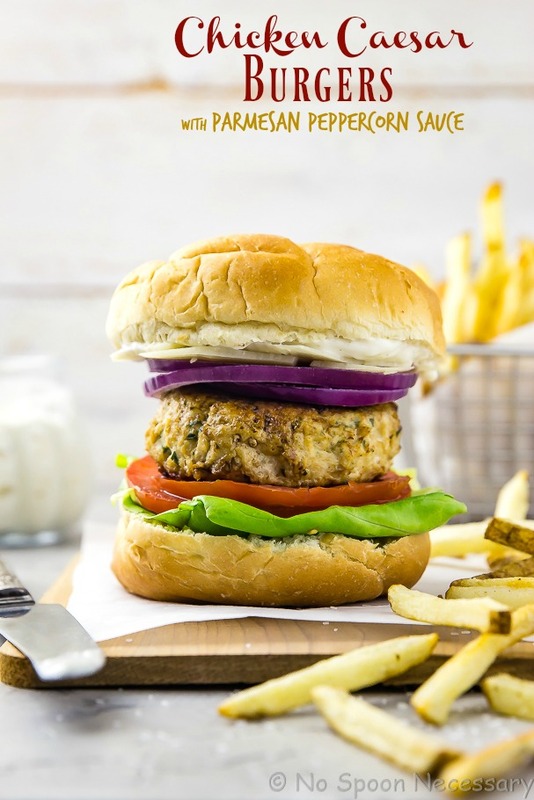 Chicken Caesar burgers are the perfect sandwich for summer barbecues, laidback lunches or easy dinners! 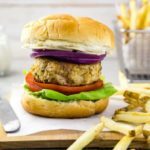 What to serve with Chicken Burgers? While the recipe calls for any ground chicken, I highly suggest you use ground dark meat chicken. 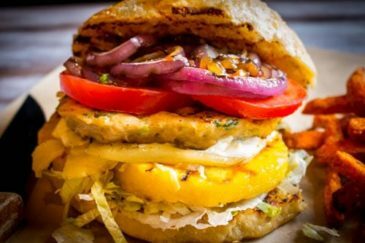 Lean ground chicken breast is fine, but your burger won’t be as flavorful and juicy. For the Caesar dressing in the recipe below, you can either make your own or use your favorite store bought dressing. Just make sure you use a dressing that is THICK. If you use one of those fat free or vinaigrette style dressings your burger is going to turn out not so great. So, if you are buying the dressing make sure you buy a quality brand that makes a CREAMY style Caesar dressing. The topping options for these burgers are limitless. I listed some of my favorites in the recipe below, but feel free to keep these minimalistic (with just lettuce and tomato), or let your imagination run wild (with additions such as avocado and sliced hard boiled eggs). If you are a big fan of truly classic Caesar salads, I highly encourage you to add a few anchovies on top!! If you are a caesar salad sans the croutons type of person, serve this burger wrapped up in lettuce and nix the bun! 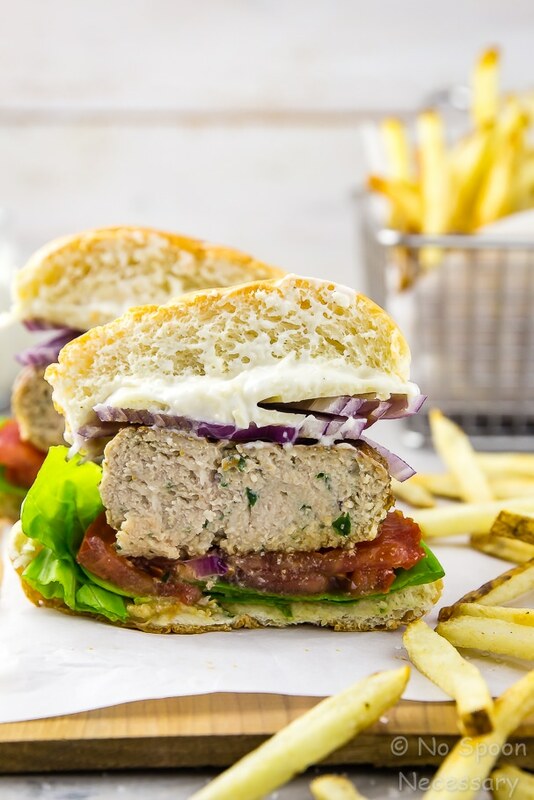 These Chicken Caesar Burgers with Parmesan Peppercorn Sauce are everything you love about the traditional salad, just stuffed between two buttery brioche buns! Healthier and lighter, these salad inspired bad boys are a great alternative to traditional red meat burgers! Until Thursday friends, cheers – to mashing up the classics. These light and easy Chicken Caesar Burgers are a deconstructed take on the classic salad. No egg, breadcrumbs or weird fillers, just ground chicken and everything you love about Caesar salad, served on a buttery brioche bun! 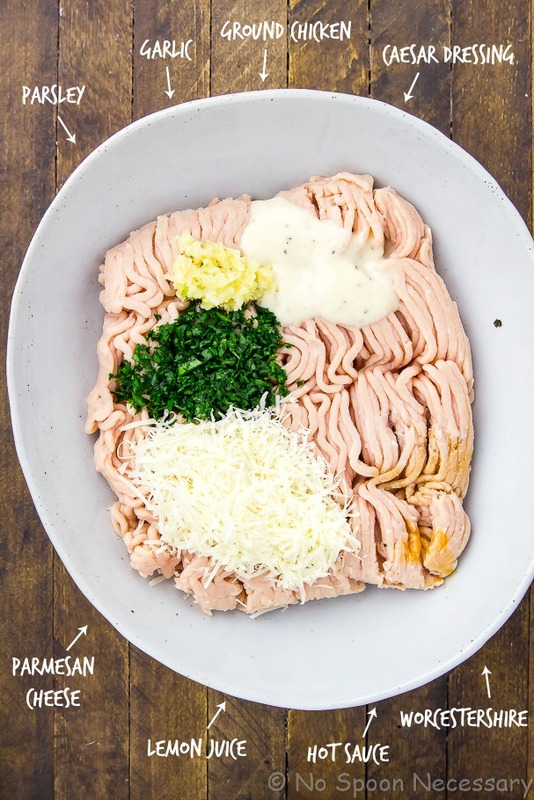 Make the burger patties: In a bowl, combine the chicken, parmesan, ceasar dressing, garlic, parsley, lemon juice, Worcestershire and a dash of hot sauce (if using). Season with a pinch of salt and a generous amount of pepper. Mix together and form 4 round burger patties. Transfer patties to a plate, cover and chill for 30 minutes, or up to overnight. Meanwhile, make the sauce: In a small bowl combine all the ingredients for the sauce. Stir in ½ teaspoon fresh cracked pepper and a pinch of salt. Cover and refrigerate for at least 1 hour, or overnight for best results. Cook the burgers: Brush both sides of each patty lightly with oil. Heat a large nonstick skillet, grill or grill pan over medium to medium-high heat*. Add patties and cover skillet with a lid, or close grill top. Cook, flipping once halfway through cooking, for 8-10 minutes, or until an internal temperature of 165 degrees F is reached. To serve: Place the patties on the bottom bun and top with desired accoutrements. Slather the top bun with parmesan peppercorn sauce and place burger tops (sauce side down) on burgers. Enjoy! 1. While the recipe calls for any ground chicken, I highly suggest you use ground dark meat chicken. 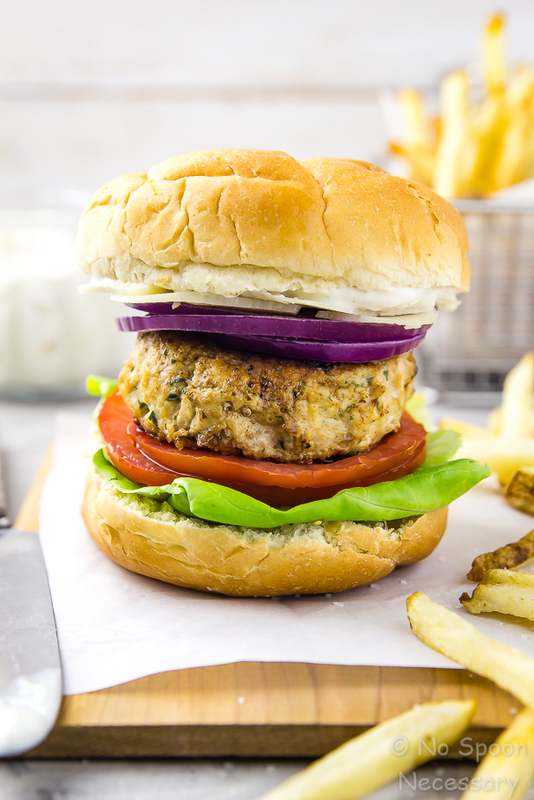 Lean ground chicken breast is fine, but your burger won’t be as flavorful and juicy. 2. For the Caesar dressing, you can either make your own or use your favorite store bought dressing. Just make sure you use a dressing that is THICK. If you use one of those fat free or vinaigrette style dressings your burger is going to turn out not so great. So, if you are buying the dressing make sure you buy a quality brand that makes a CREAMY style Caesar dressing. 3. The topping options for these burgers are limitless. 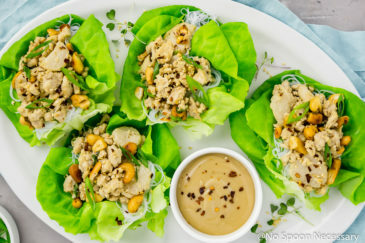 I listed some of my favorites in the recipe below, but feel free to keep these minimalistic (with just lettuce and tomato), or let your imagination run wild (with additions such as avocado and sliced hard boiled eggs). If you are a big fan of truly classic Caesar salads, I highly encourage you to add a few anchovies on top!! 4. If you are a caesar salad sans the croutons type of person, serve this burger wrapped up in lettuce and nix the bun! 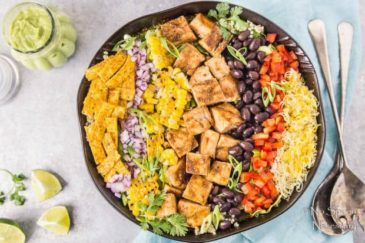 Hey now this looks like the perfect switch up from beef burgers and mixed with all sorts of tasty goodies. I definitely toast that brioche bun and slather on some extra sauce! Looking good Chey! Summer cookouts are the BEST! And what a delicious burger you’ve created Chey! We had a quiet celebration last night… the Solstice! And I could totally tell.. the sun has been rising at 4 am here and doesn’t set until around 10! WOAH! Talk about long days! I’m out grilling at 7am! hehe (#foodblogger). But I just really want to pluck a french fry off my screen Chey! Hope your Summer is fabulous! Thank goodness for the official arrival of summer! I am in love with everything about this burger! I’m totally firing up the grill, popping ipen a beer, and topping mine with some avocado! Cheers! Chicken and Caesar were made for each other!! These burgers are perfection!! Can’t go wrong with brioche and that sauce, I’ll take extra!! Take care.